The origins of the first Paediatric Pathology Club lay in the rapid development of paediatrics that occurred in the United Kingdom associated with the introduction of the National Health Service in 1948. This, for the first time, introduced facilities for children's hospitals and the possibility of doctors taking up full time careers in paediatrics and paediatric pathology. The British Paediatric Association, which was then a club restricted to 60 members, held a single annual meeting each year at Bowness on Windermere in the Lake District. It was traditional that the members brought along at least one guest and one assistant. This brought a small group of people doing paediatric pathology together each year. At that time the distinction between academic paediatricians and paediatric pathologists was much less than today. The British Paediatric Association meeting were very social gatherings and foreign visitors were always invited so that each year there was usually someone from other parts of the world such as David McKenzie from Capetown. There were always laboratory oriented people from Scandinavia such as John Lind and others from Holland and France. At that time most people doing paediatric pathology were basically paediatricians who had a particular feel for laboratory sciences and most ran the complete pathology service for their hospitals. Paediatric pathology had specialised more rapidly in Scotland than in England and Dr. Agnes Macgregor was well established at the Children's Hospital in Edinburgh. One of her trainees, Alistair MacDonald, had moved to the Children's Hospital in Glasgow and another, Albert Claireaux, had gone to London (Queen Charlotte's Hospital). Sir Leonard Parsons had "captured" a haematologist from Europe for Birmingham, Henry Barr, and Keith Rogers did the microbiology there. Martin Bodian had recently been appointed to Great Ormond Street and I had been appointed to Sheffield with the creation of the new University Department of Paediatrics. At that time Wilfred Payne was doing biochemistry at Great Ormond Street and Ian Cathey the haematology and bacteriology. Edgar Morison had recently returned from a year in Boston. Fred Langley ran the laboratories at the Women and Children's Hospital in Manchester - to mention only a few. Paediatric pathology was obviously rapidly expanding and there were many more interested in paediatric pathology that could attend the BPA meetings. The need for the formation of such a group was felt principally by Agnes Macgregor, Keith Rogers and myself and we decided to do something about this. 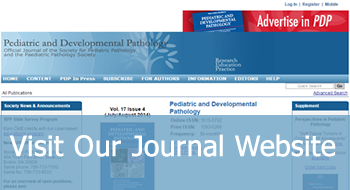 We decided to write to all paediatric pathologists we knew throughout the world, asking if they would be interested in forming a paediatric pathology club. I did this and we received a series of enthusiastic replies from almost every one of them. These people included Jim Arey (United States), Bill Donohue (United States), Douglas Riley Australia), Dorothy Anderson (United States), David McKenzie (South Africa), Fred Wigglesworth (Canada), George Fetterman, Alan Williams and John Perry (Melbourne), C.B.F. Daamen (Rotterdam) Christian Nezelof (Paris) and Edith Potter (Chicago). (These letters from those who were essentially the pioneers of paediatric pathology, were all preserved but unfortunately were later mislaid). The Paediatric Pathology Club was inaugurated by those attending a meeting held after dinner in the bar at the BPA meeting Easter 1955 when Agnes MacGregor took the chair. We called a first meeting in Dr. Macgregor's department in Edinburgh in December 1955. All those interested from abroad were notified together with all those we knew locally concerned with children's pathology. This included a considerable number of general pathologists, some of who, such as Gladstone Osborne of Derby, were extremely active in children's pathology and Rupert Willis who had recently completed the "Borderland". The founder members included Agnes Macgregor, John L. Emery, H. Basil Marsden, J. Edgar Morison, Jean M. Scott, F. Langley, A. MacDonald, D. Bain, N. Brown, E. Hall, E. Allibone, K. Rogers, B. Ockenden, H. Cameroon and many others. It was decided to run an informal club for a few years and this was accepted at the first general meeting of the Society, to run a general club for the first years, open to anyone who was interested and that the secretary would simple hold a circulation list. There was no fixed membership and no fixed subscription, the cost of postage and running of the Club was collected as a fee from those attending the annual meeting. The annual meeting was held in a different centre each year with the aim of stimulating the development of children's pathology in that centre. The local pathologist was the President/Chairman. We wished to find where the needs were and it was felt that we did not want to form a society in which the majority of members were people doing general pathology or general paediatrics, which could easily have occurred. Thus for the first few years of the Society, from 1955 to 1962 while I remained secretary, there was no fixed constitution or fixed subscription. During this time a pattern of membership and interested people had developed and when Hugh Cameron took over from me as secretary, rules were drawn up and an official membership list made. Alistair MacDonald, our first treasurer, insisted that we should cease to call ourselves a "Club" and become a "Society" as only by such means would members be able to claim expenses from income tax. It was a rare year that one or other of our overseas members did not attend the meetings; particular regular attendees were Bill Donohue from Toronto, Fred Wigglesworth from Montreal, Jim Arey from Philadelphia, David McKenzie from Capetown and Alan Williams from Melbourne. The question of the formation of a separate society in North America arose and this was discussed at some length at the International Paediatric Conference in Copenhagen with Sidney Farber. He insisted that alternative meetings of the PPS should be held in Boston, but it was felt that this was not practical or desirable. Following this meeting he decided to form the North American group. After the North American group formed the SPP (The Pediatric Pathology Club in early years) in 1965, PPS meetings were held annually, usually in the autumn. The meeting host was President for the year. Most meetings were held in the UK with a few on the Continent including Rotterdam in 1968, Goteborg in 1971, Groningen in 1977, and Helsinki in 1981. A development has been the organisation of joint meetings with other Societies: the SPP in Cardiff in 1974, Toronto 1975, and Washington in 1987, the Developmental Pathology Society in Birmingham in 1976 and in Sheffield in 1979, and the European Society of Paediatric Research in Cambridge in 1984. The 25th meeting of the PPS was held in Sheffield in 1979. This was followed by the first Advanced Course in Paediatric Pathology run by John L Emery under the International Paediatric Pathology Association umbrella. In 1983, there was much debate about the advisability of joining IPPA. It was clear at this point that the SPP and Australasian Society had committed themselves to join. A formal proposal that the PPS join IPPA was supported by a substantial majority of members present. The success of IPPA courses was apparent and a 'younger' members group (now the Course Graduates Meeting) was convened for the day prior to the PPS meeting, by now largely settled in to a Thursday evening to Saturday lunchtime format. Another development has been a sightseeing/social event on Saturday afternoon and evening. These have been well attended and much enjoyed. The perceived need for a higher profile for the Society, particularly in its relationship with other Societies such as the European Society of Pathology, culminated in the decision to have an elected President with a 3 year term following a year as President Elect. The Society achieved charitable status in 1984 and, following an increase in subscription, is able to assist pathologists from less advantaged countries to attend PPS meetings. Some national paediatric pathology groups are also sponsoring attendance at the PPS meetings. With increased European membership, a decision was taken to hold UK meetings every second or third year with alternative meetings on the Continent. In 1992 the PPS hosted a meeting of all the Societies of Paediatric Pathology in Barcelona. Delegates from the SPP, South America, Australasian and Japanese Societies attended as well as individual paediatric pathologists from the rest of the world. A donation to the Society (the Interferon Fund) enabled the institution of a guest lecturer at the annual meeting. This has enabled us to invite speakers from within the Society and outside. The first Interferon lecturer was Helga Rehder who spoke in Dublin in 1982 on Fetal Pathology of Chromosomal Anomaly Syndromes. A guest lecture has taken place at most meetings since then. Following the death of Norman Brown, one of our founder members, his family and former colleagues presented a sum of money to fund a memorial fund. This has been used to create a prize for the best presentation at the annual meeting by a junior member or guest. When the Society was formed there were members from all pathology disciplines. As specialisation has continues the haematologists, bacteriologists and chemical pathologists have drifted away, and most members of the PPS now are histopathologists. The Society has continued to develop, evolve, adapt and gain strength, and its membership has expanded particularly within Europe. Membership passed the 200 marked in 1992, and at that point 40% of members were UK based, 40% from Europe and 20% from the rest of the world. Current membership is 230, and we have members in 19 countries within Europe and 12 other countries world-wide. Forty plus years old and running well is an appropriate summary of the current state of our Society.